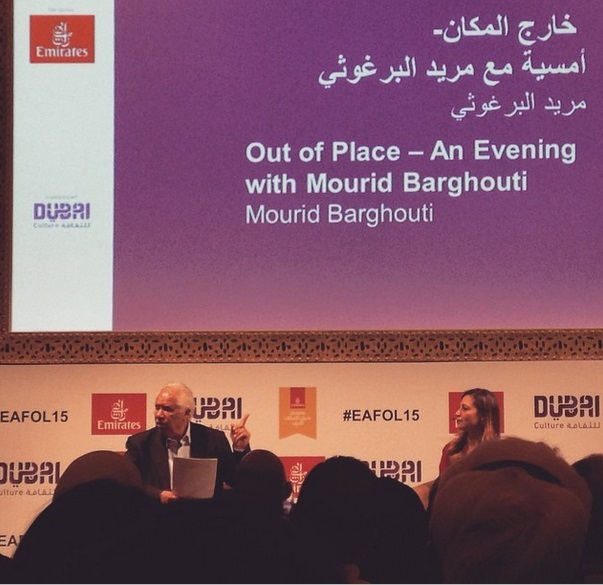 The Seventh Emirates Airline Literature Festival featured a session with Palestinian poet and memoirist Mourid Barghouti titled Out of Place. While the introductory part of the session focused on what place means to Barghouti as a poet, the remainder delved into other ideas: including the obsession with the past, the use of hyperbolic language, and aesthetics in Arab poetry. Barghouti shared his wisdom with a sizeable audience, making them laugh at times, and leaving them pondering his heartfelt statements at others, not least because they could – and should! – be applied to life as we live it. Spontaneous applause after such statements was not uncommon, and attendees were left wanting more. The following expands on key themes Barghouti touched on while responding to questions posed during the session. 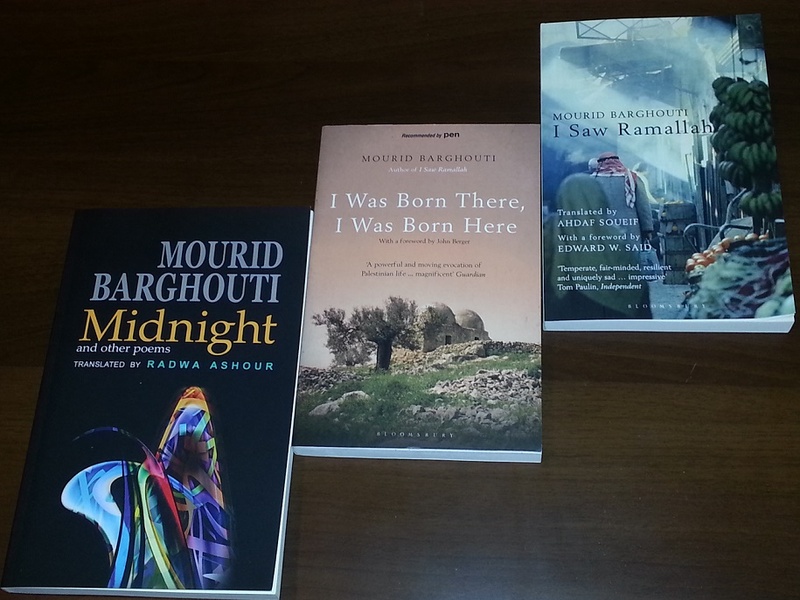 Barghouti started by saying that thirty years of exile have taught him that there is no one definition of place. The idea of “place” was taken away from him a long time ago, he said, as he pointed out that he is four years older than the state of Israel. He played with the idea of “time as place, and place as time.” The past is a place, he said, before sharing that he has learnt over time that barriers do not define a place. He asserted that the sole difference between the horizon and the prison cell is our feeling towards each of them. He then posed the question: “What happens when the difference between here and there becomes blurry?” He asserted that the sole difference between the horizon and the prison cell is our feeling towards each of them. In both personal and national cases, these two contradictory places can be the same place, or can even become one place. What makes you write poetry? The UAE is a young country, forty-three years old. Poets have said that with the skyscrapers and increasing development, the only place for cherished childhood memories of grandmother’s house is in the poem. What do you think? Leave the past where it belongs and go forth to tomorrow … think of tomorrow’s morning. “I’m for human and architectural progress, and not looking at the past with excess consecration or romanticization. Tomorrow is what matters. What happened to us yesterday, we don’t live today. Leave the past where it belongs and go forth to tomorrow … think of tomorrow’s morning.” Barghouti’s response was thunderously applauded by the audience, which marvelled at how a man who has lived through such a tumultuous past could be so optimistic about the future. Numerous tweets were hurriedly posted to share this statement with the wider world. You’ve talked previously in other forums about tabriid al-lugha, literally a cooling of the language – what do you mean by this? He went on to refer to his experience as the Chair for the International Prize for Arabic Fiction panel this year, and the type of writing he witnessed in some of the novels that came before the panel. “In some of the books I read, there were phrases such as ‘brutal aggression’, as if all aggression isn’t brutal!” The use of such modifiers for nouns that are already clear points to lazy writers, he said. Hyperbolic language makes writing ‘heated,’ Barghouti continued, before making clear he prefers to ‘cool’ it down, to make it simple. He then offered the following sentence as an exemplary illustration of his point: “‘Ahmed entered. I looked at his face, and saw that he was very tired.’ I, as Mourid Barghouti, when I read this sentence, I get rid of the ‘very;’ it weakens the idea of how tired he is. ‘I saw that he was tired,’ is much stronger than ‘he was very tired.’ The writer who puts ‘very’ in his writing loses the ability to convince you just how tired that person is.” He concluded his answer with the thought that the more detailed he gets in his writing, the less hyperbole is needed. Is the aesthetic in your poetry always political? Mourid Barghouti ended his talk by reading a poem dedicated to his late wife. The rhythm of his syllables and the cadence of his phrases gripped the audience, who could not help but feel that they had witnessed the recitation of one very long yet engaging poem. Many were struck by his immense humility, and how he continually thanked the audience not only for their attendance, but also the very intellectual nature of their participation. Labelled as a Palestinian poet, we know where he hails from and what his profession is, but sitting through Barghouti’s session at the Emirates Airline Literary Festival assured the audience that what they witnessed was a mere scratching of the surface of a literary giant who goes far beyond the casing of conventional definition. Sawad Hussain is an Arabic teacher, translator and litterateur residing in Dubai.